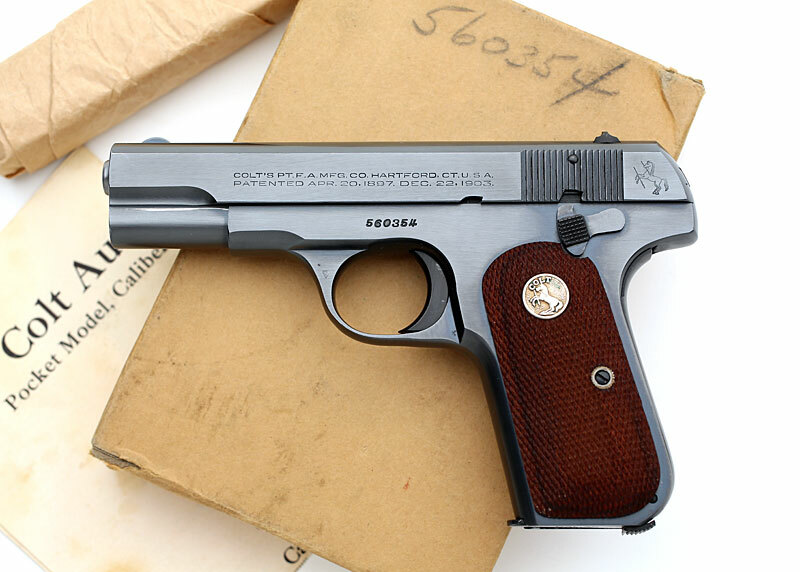 Colt Model M .32 ACP serial number 560354 - Military Model M .32 ACP pistol, blued, with U.S. PROPERTY mark on right side of frame and punch dot on right trigger guard. Pistol was issued to Colonel Carl Rueben Dutton, USA and is in original box with instructions and spare magazines. 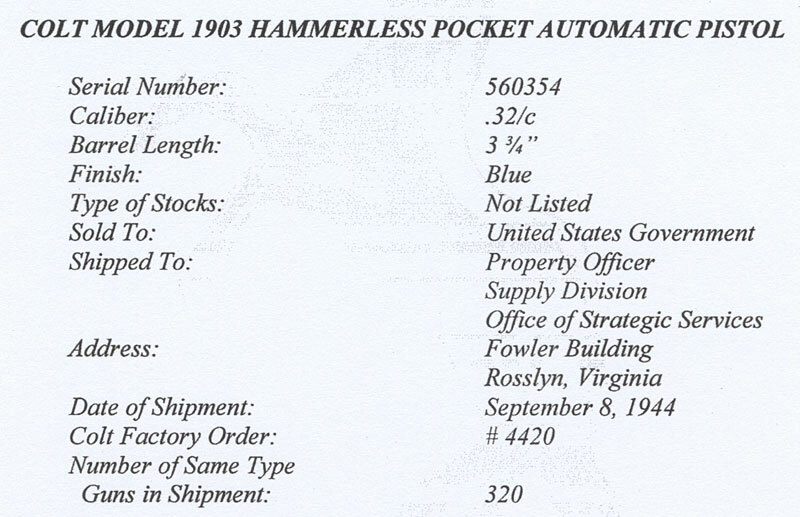 Pistol was one of 320 sold to the United States Government and shipped on September 8, 1944 to the Property Officer, Supply Division, Office of Strategic Services, Fowler Building, Rosslyn, Virginia and processed on Colt Factory Order 4420. 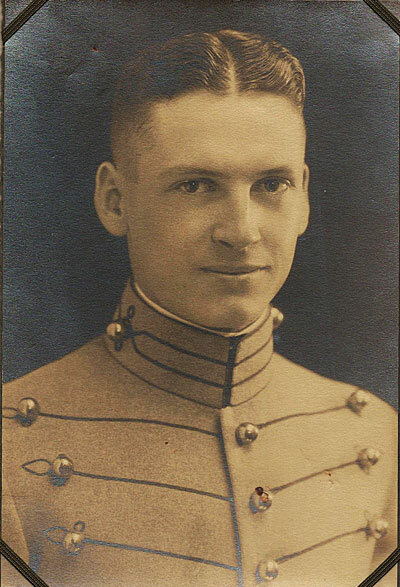 Colonel Dutton graduated from West Point in 1925. He was the first officer chosen by the Army to head the Manhattan Project. But the Army put the decision to build the bomb on hold for six months whereupon, before the war, he was assigned to build TNT plants, including the US largest at Weldon Springs. Col. Dutton wasn’t notified about his prior selection to head the Manhattan Project until after just the War. While in China, he dined with Chiang Kai-shek nearly weekly. 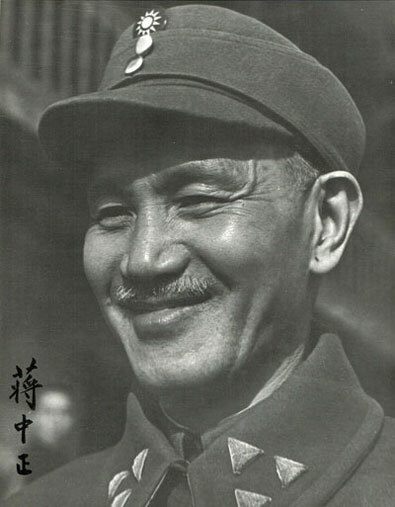 By his own account, he was the most decorated American by the Chinese government during the war. He also claimed to have held the record of flying over the "Hump" 17 times without crashing. The military cargo planes tended to be in terrible shape. He only pulled (but didn’t shoot) his pistol once for defense. That was when he believed a Japanese spy was tailing him in the streets of Chungking. Near or after the war Col. Dutton led American historian Douglass Southall Freeman through China during a facilities inspection. Freeman’s notes are at the Special Collections Library, University of Virginia. Freeman presented a 4-volume set of Lee's Lieutenants: A Study in Command to Col. Dutton in thanks for the tour through China. Details of his distinguished career are described below. 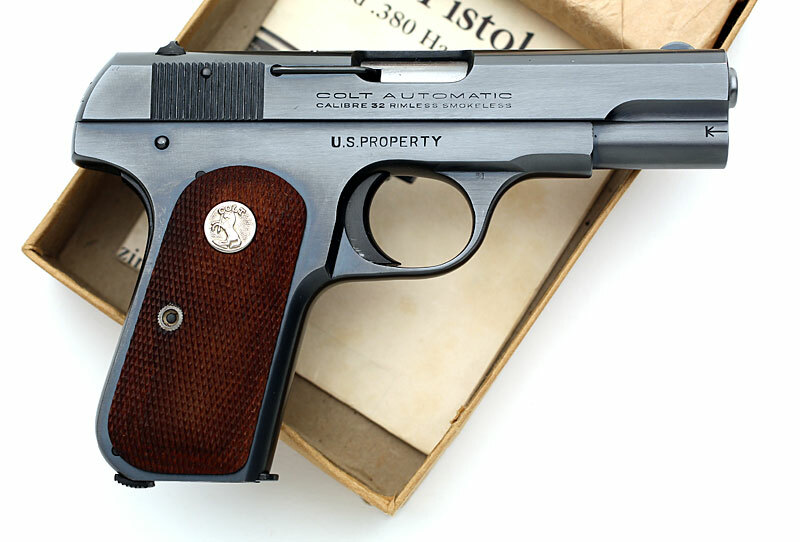 Colt 1903 Pocket Hammerless .32 ACP - serial number 560354 right side showing U.S. PROPERTY mark on frame. Experimental Philosophy, U. S. Military Academy, Aug. 25, 1930, to present. Carl Rueben Dutton was born on 11 November 1901 in Streator, Illinois, the fifth of nine children of George Adelbert Dutton and Inez Rosella (Smith) Dutton. During childhood he developed a strong sense of responsibility as he helped with farm chores, and, at the age of ten, he became self supporting by taking care of a neighbor's farm. Later he was able to put himself through the first two years at Michigan Agricultural College (MAC), now Michigan State University, by working in the MAC clinic. Carl learned of West Point from college classmates. Fortunately, the head of the MAC clinic was able to arrange an interview for him with the state governor who, in turn, contacted Michigan Senator Truman H. Newberry. After his interview with the senator, Carl received his appointment to the Academy. At the beginning of his first class year he was advanced to cadet captain of F Company and chosen to be "King of the Beasts" for the incoming Class of 1928. On Graduation day Carl married Vera Belle Allen. His first duty station was Fort Hancock, New Jersey, but by 28 October 1925 Carl and Vera were on their way to the Philippine Islands (1925-1927), where their first son, Richard Allen Dutton was born on 31 January 1927 on Corregidor Island. Their second son, Robert Harding Dutton, was born on 15 August 1928 at Aberdeen Proving Ground, Maryland where Carl was detailed to the Ordnance Corps. Selected to attend the Massachusetts Institute of Technology (1929-1930), he completed the Ordinance Engineer Post Grad Course and was appointed an instructor at West Point (1930-1935). During that period he transferred to the Ordnance Corps. After completing the Advanced Ordnance Course at Picatinny Arsenal, New Jersey (1935) and Aberdeen Proving Ground (1936), he was selected to attend the University of Michigan (1936-1939) where he earned a master of science degree in chemistry. He had nearly completed the Ph.D. requirements when he was reassigned to Picatinny Arsenal (Assistant Chief, Technical Division, 1939-40). He then received orders to supervise the building of the Weldon Spring Ordnance Works (WSOW) in Missouri (Commanding Officer, 1940-1942) while simultaneously commanding the Missouri Ordnance Works and supervising the construction of the Kentucky Ordnance Works (1942). The WSOW became the largest TNT manufacturing facility in the country at that time, with over 30,000 workmen employed at the peak of construction. By 1942 WSOW was producing approximately one million pounds of explosives per day, a fact which contributed markedly to the outcome of the war. Following service as president of the Ordnance Board (1942-1943), Carl was assigned to the China-Burma-India Theater (Assistant CBI Theater Ordnance Officer, 1943; Commanding Officer, American Advisory Group to the Chinese Z-Force, 1944; General Staff Corps with troops and Assistant Chief of Staff G-4 of the China Theater, 1944-1946). Returning to the United States in 1946, he was assigned to the Picatinny Arsenal (Chief, Technical Division, 1946-1951; Deputy Post Commander, 1951-1952). 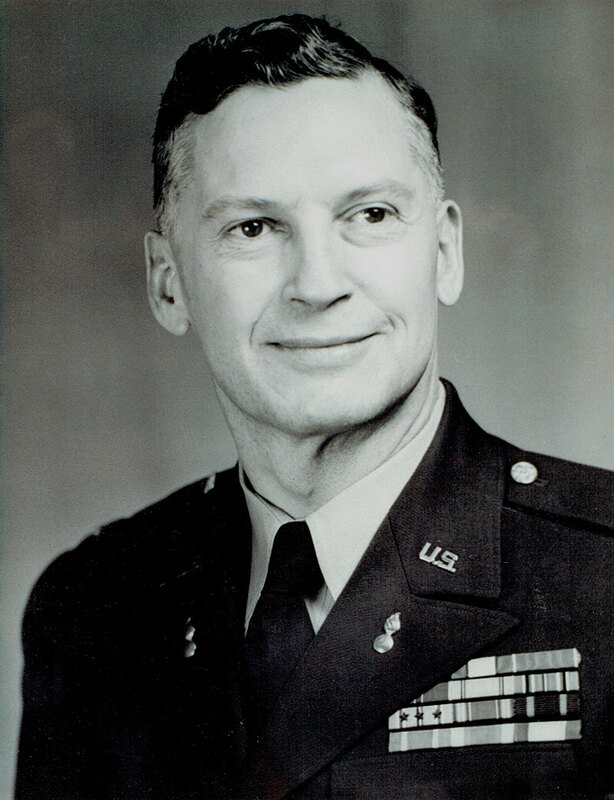 His last tour of duty was at Aberdeen Proving Ground (Executive Officer, 1952-1953; Chief of Staff and Comptroller, 1952-1954; Deputy Post Commander, 1954). He retired on 30 September 1954. The University takes pride in the indirect role it has played in bringing about the successful conclusion of the many important war projects at Picatinny Arsenal. Appearing above are some of the alumni who have recently been there: Front row, Col Carl Dutton, M.S. '37 and Major John D. Prendergast '49-'50; back row, Major John Le Maintre, '30, Lt. Louis Dehmlow, '50, and Capt. Keith Bronson, '41. CHUNGKING, Sept. 10 -- General A.C. Wedemeyer, Commanding General of the U.S. 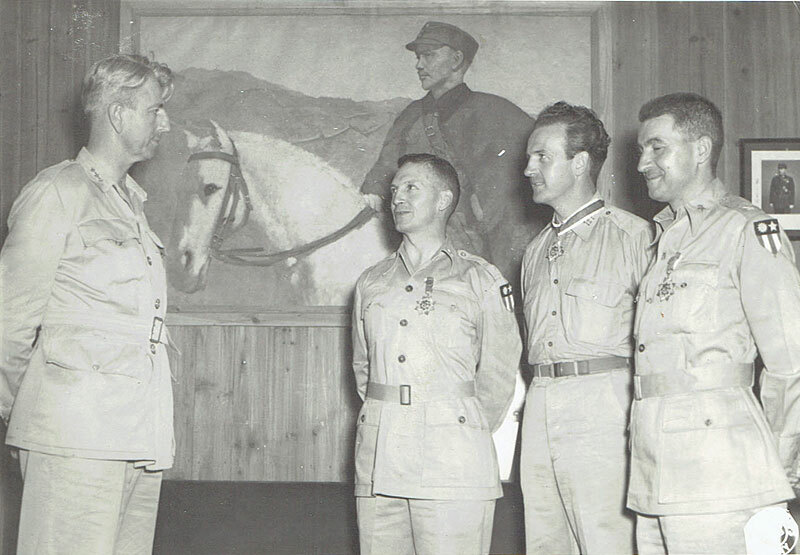 Forces, China theater, talks with U.S. Army officers to whom he has just presented with Chinese military decorations. The men and the decorations received are (left to right) Col. Carl R. Dutton, 203 Forest Circle, Paducah, Special Breast Order of the Cloud; Lt. Col. Waldo A. Kennerson, Marblehead, Mass., Special Collar Order of the Cloud and Banner; Col. Antonio L. Gado, El Paso, Tex., Special Breast Order of the Cloud and Banner. Col., Dutton whose family has resided in Paducah since he came here as first commanding officer of Kentucky Ordnance Works in 1942, has been awarded, previously the Legion of Merit medal for meritorious service in the Chinese theater." He is a graduate of West Point Military Academy in the class of 1925. He has been in China for more than two years. His family expects him home for Christmas. 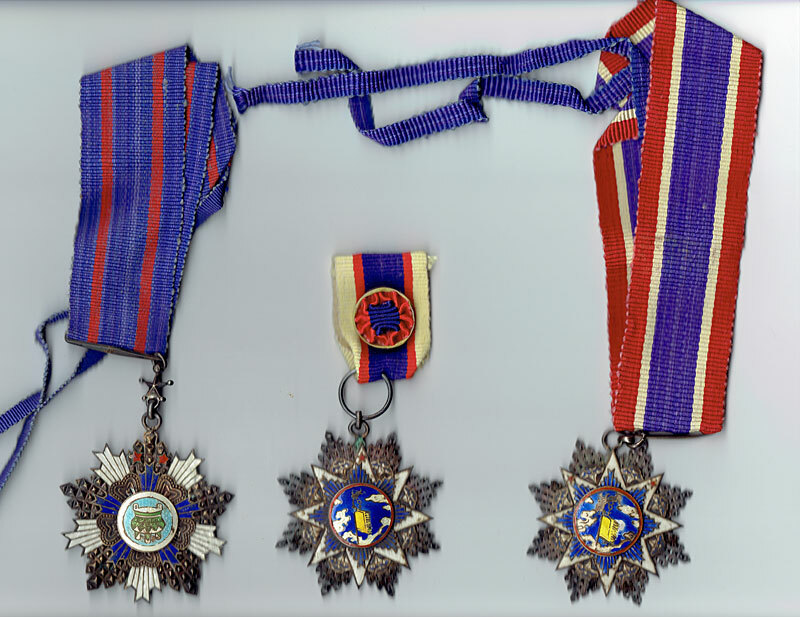 Carl was authorized to wear the following decorations and awards: Distinguished Service Medal, Legion of Merit, Bronze Star Medal, American Defense Service Medal, American Campaign Medal, Asiatic-Pacific Campaign Medal with three Bronze Service Stars, world War II Victory Medal, National Defense Service Medal, Chinese Order of Pao Ting, Collar (presented personally by Generalissimo Chiang Kai-shek), Chinese Order of Banner and Cloud, Collar Order of Yun Hui and Collar Order of Precious Tripod. 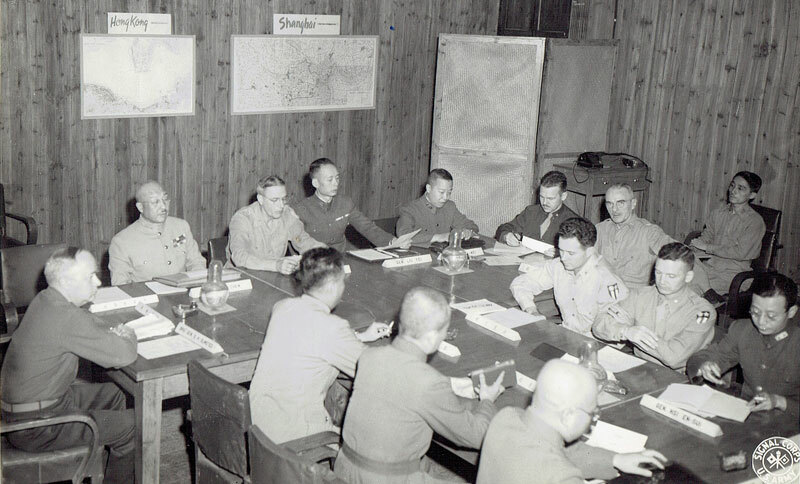 The citation for the Distinguished Service Medal (1946) said, in part, "He organized, coordinated and implemented the theater's supply and logistical program and established a spirit of cooperation between Chinese officials and American agencies. The success of the supply mission during the difficult period was attributed largely to the sound judgment, tact, and diplomacy which he exercised." general Order Number 144 (24 September 1954) stated that Carl's "career is one of marked achievement throughout long years of faithful and meritorious service to his country in peace and war. His professional accomplishments, outstanding leadership and devotion to duty have been an inspiration to those who have served with him." After retirement, Carl and Vera settled on the coast of Maine to enjoy the natural beauty of the area, wonderful visits from loving family members and friends, and the chance to read and learn. Always a devoted husband and loving father, grandfather and great-grandfather, at the age of 89 Carl peacefully entered the Spiritual Realm. Throughout his life he set an example of courtesy, Kindness, generosity, conscientiousness, self-effacement and fair-mindedness while always emphasizing the good in others. Truly of this loyal and honorable gentleman with purest heart, it can be said, "Blessed are the pure in heart; for they shall see God (Matt. 5:8)." 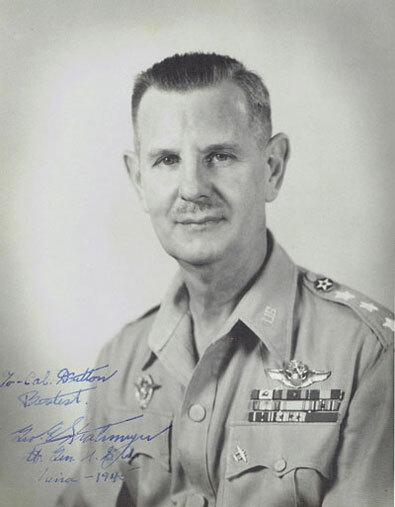 (Citation Needed) - SYNOPSIS: Colonel (Coast Artillery Corps) Carl Rueben Dutton (ASN: 0-16048), United States Army, was awarded the Army Distinguished Service Medal for exceptionally meritorious and distinguished services to the Government of the United States, in a duty of great responsibility from 1944 to 1946. (Citation Needed) - SYNOPSIS: Colonel (Coast Artillery Corps) Carl Rueben Dutton (ASN: 0-16048), United States Army, was awarded the Legion of Merit for exceptionally meritorious conduct in the performance of outstanding services to the Government of the United States in the China-Burma-India Theater from 1943 to 1944.